Haven’t decided on a hotel yet? You can look at other available hotels in the Baden-Württemberg region with Booking.com. Baden-Württemberg’s popularity is rivaled only by that of Bavaria. It offers the charming university towns of Heidelberg, Tübingen, and Freiburg, glorious castles, and fine resorts, all set against a splendid backdrop of snowcapped peaks to the south, one of Europe’s loveliest lakes—Lake Constance (the Bodensee)—and the magic and folk traditions of the Black Forest, or Schwarzwald. There is an amazing variety of sports and recreational facilities to keep residents and visitors alike active. To get the most out of the region, a rental car is really the best way to get around. If you are particularly fit, you’ll find well marked bicycle routes a delight, especially on the “Castle Route.” In summer, make sure you reserve ahead for hotel rooms. Among the first inhabitants of Baden-Württemberg were the Romans who settle here to produce wine--a local industry that today enjoys world-wide fame for its quality. An number of the region’s historic hotels also feature wine from their own vineyards, a treat not to be missed at dinnertime. The region is the home of two great German dynasties: The Hohenstaufen and the Hohenzollern families produced some of Germany’s most famous kings and emperors, including Frederick Barbarossa, Frederick II, and Frederick the Great. With a long, turbulent history, the region didn’t fall in line with Bismarck and Prussia until 1871. 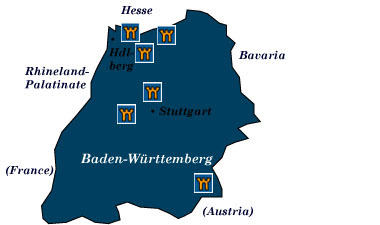 Today’s state of Baden-Württemberg merged from the historic states of Baden, Württemberg, and the former principality of Hohenzollern after World War II. The Black Forest (Schwarzwald) Covering an area roughly 150 km (20 miles) long and 40 km (24 miles wide), the Black Forest is home to captivating little villages and spa towns that seem scarcely touched by the modern world. Skiers, mountain climbers, hikers, and fishing fans can pursue their passion to their hearts’ content here. Driving around the Black forest is easy, with plenty of opportunities to stop and enjoy nature or poke around that quaint village along the way, take a stroll in the countryside, or explore a castle. For those who want to take home the quintessential Black Forest souvenir, come to the village of Triberg, which is not only rich in high tourist paraphernalia but boasts an extraordinary collection of cuckoo clocks. Triberg also has superb hiking trails that meander past idyllic and traditional farms (open to visitors) and the Donauquelle, source of the mighty Danube River. Baden-Baden is the most famous of all the German spa towns. Since Roman times, the rich, the famous, the sick, and the aching have come here to take the waters. Tree-lined promenades, gracious homes, and perfect parks help the stressed out to relax. The Neckar Valley and the Castle Road (Burgenstrasse). Wooded- and vineyard-covered hillsides, flowering orchards, and grand castles contribute to the romantic and gentle landscape of the Neckar Valley. The Castle Road travels 975 km from Mannheim to Prague in the Czech Republic, passing by some 70 fortresses, ruins, and castles. Worthy of a visit are Schloss Zwingenberg, where the annual Schlossfestspiele (or music festival) takes place every August, and Burg Guttenberg, a leading center and sanctuary for birds of prey. Lake Constance (Bodensee) Sharing part of its shoreline with the state of Bavaria, the snowcapped peaks of the Swiss Alps across the lake make a stunning backdrop to this delightful recreational area. Ferries ply its shores, stopping at the ancient town of Konstanz—its cultural center; Mainau Island, where its Schloss of the Knights of the Teutonic Order is now a garden center; Meersburg, a beautiful little half-timbered village surrounded by vineyards and dominated by two castles, the Altes and Neues Schloss. Heidelberg For centuries this ancient university town’s red sandstone castle has inspired composers and authors with its romantic Gothic turrets and Renaissance walls. Tübingen has medieval houses that glimmer in the Neckar River, narrow, cobbled streets, and a Renaissance castle above the town. Many visitors prefer Tübingen over Heidelberg for its smaller size, authenticity, and fewer crowds. Burg Hohenzollern was the fortress stronghold of the foremost Prussian dynasty of the same name. From the 15th century until Kaiser Wilhelm II gave up the throne after World War I, the Hohenzollerns dominated Prussian politics. Today’s imposing castle, visible from miles away, is the descendant of an earlier 13th-century castle. Ulm, situated on the Danube River, its Münster tower is the highest church spire in the world at 161.1 meters. Climb the 768 spiral steps for magnificent views of the Black Forest and surrounding mountains. Ulm is also the birthplace of Albert Einstein.